I had previously talked about two of Belfast's leading restaurateurs in Eddie Fung and Michael Deane, pioneers who have put the Belfast food scene on the map. Another pioneer of equal standing is Niall McKenna of James St South. For years James Street has had one of the best reputations for fine dining in Ireland. But fine dining has a time and a place especially since the recession which saw this sector of the hospitality industry suffer. This caused restauranteurs to adapt their offerings with many changing direction completely. Aldens in Ballyhackamore instantly springs to mind. While Niall and his wife Joanne have not only weathered the recession but thrived in opening a number of further restaurants and eateries. The Bar and Grill, located next door to James St South, focuses on cooking meat on their outrageous Josper Grill. Cast & Crew, located beside Titanic Belfast, is a casual and quirky lunch/breakfast venue and finally the Cathedral Quarter based Hadskis. So what is Hadskis? In my eyes Hadskis is an adaptation of James Street South. The same ethos in providing and sourcing local ingredients but presented in a bistro style with a moderately priced menu. I previously ate in Hadskis back when it first opened in 2013 but from memory it was after a number of Guinness's in the Duke of York so I can't comment too much on that experience. This time round I was with a large pre-wedding party of 15 for lunch so we were seated upstairs in their private dining area. Open, bright, spacious with a small bar to the corner. 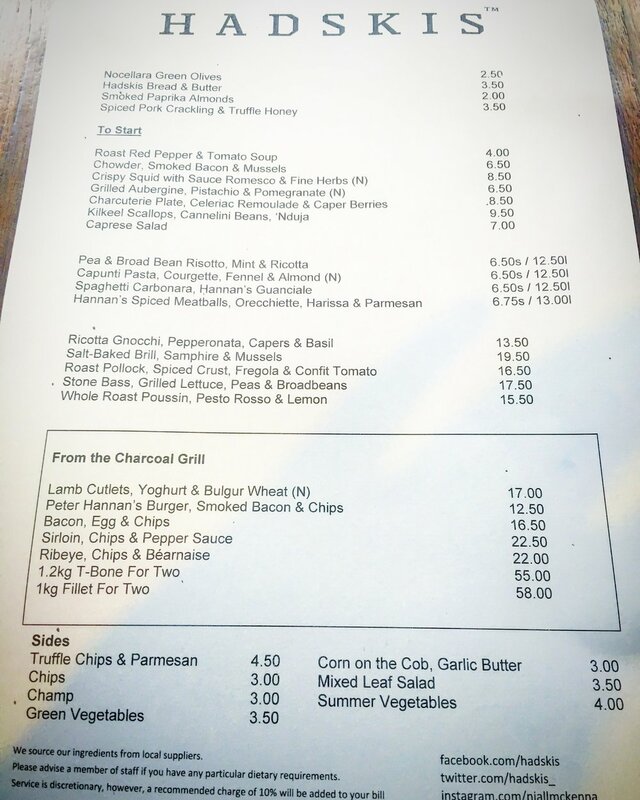 The menu as can be seen is varied and split into 5 areas; light bites or 'nibbles' as my wife would put it, starters, dishes that can be served as either starters or mains, mains and a boxed off section that was the first thing to catch my eye-the charcoal grill. If you have read this site before you will know from my recipes I love anything cooked over charcoal. I was on for the grilled Lamb Cutlets, that was until I heard the specials. To start I opted for the crispy squid with sauce Romesco & fine herbs. Squid is my favourite seafood so I have plenty of experience both in cooking it and eating it in many restaurants. It is a tricky ingredient to get right. Overcooked it's like rubber and it can be a matter of seconds for this change in texture to occur. It was served thinly sliced in batter with a mixture of herbs sitting on top and the quenelled sauce on the side. The squid was cooked well, but unfortunately served Luke warm and slightly soggy. I presume this was due to a combination of the squid sitting, waiting for the other 14 starters to be served together and the mass of herbs sitting directly on top. The idea of placing dressed herbs directly on piping hot crispy squid and letting it sit simply steamed out the crispness. The Romesco sauce which admittedly was new to me was fresh and vibrant tasting of red pepper, tomato, a hint of garlic and the texture was slightly grainy deriving from some form of crushed nut. The crispy killer of fine herbs added freshness with pickled radish, flat leaf parsley, dill and chive but the ratio of herbs to squid was extremely unbalanced. As far as the service went it was top drawer. Drinks wise I opted for the 'in' drink of Gin & Tonic. 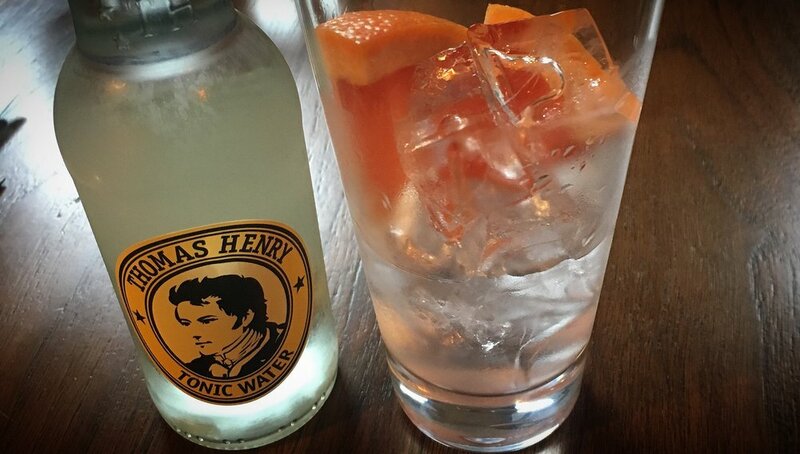 Historically G&T was something your mum drank but local distillers like Jawbox and Shortcross are getting rave reviews with the traditional G&T being served with anything from Juniper berries to cinnamon which I find a load of nonsense. I'm not a gin snob and more than happy with a Gordon's and a slice of lime. Wine snobs are acceptable in my eyes, gin snobs not so much. In fact if I see anyone order a Gin and Tonic with anything but lemon or lime I immediately judge them. Wrong I know. Anyway I digress, I ordered a gin and as fate would have it the waitress recommended a Tanqueray 10 with Grapefruit. Hmmm, I took the recommendation and it was a very pleasant surprise to say the least. When the attentive waitresses noticed I was nearly finished I was swiftly asked if I would like another and since this was a pre-wedding lunch I didn't hesitate. Hadskis offering was cooked to perfection and I loved the idea of the claw meat being presented in the head. No fiddling and poking out morsels of meat here. The lobster was drizzled with a rich but not over powering buttery sauce rather than served in a dish on the side. This meant the meat slightly absorbed the excellently umptous flavour further enhancing the natural sweetness of the lobster. The chips were the perfect accompaniment. Anybody can cook chips but not everybody can cook chips well. Ive been to may bistros that don't even cut their own where they come pre-cooked or blanched ready to be put straight into the fryer. Not here though, the chips were the correct size in not being chunky, crispy on the outside, fluffy on the onside with the all important flavourful skin partly left on. Overall I think Hadskis is a top bistro serving fresh food prepared well at a good price point. Next time I go however I will ensure to eat downstairs at the bar where you can see the chefs ply their trade right in front of you. Here you have the added advantage of your food being served straight from the kitchen meaning no soggy squid.